The 2nd Young Superintendent of Police Conference was held in New Delhi on July 26,2018. The theme of the two day conference was "Predictive Policing and Contemporary Challenges for Indian Police Forces". It was attended by over 100 Superintendents of Police (SPs) & senior officers from the States & CAPFs. 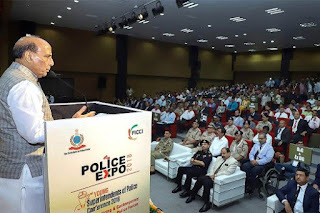 The purpose of the 2-day conference is to create awareness among young SPs and Commandants regarding latest technologies in the areas of artificial intelligence (AI), predictive policing, crime analytics, big data analytics, geospatial technology, cybercrime, surveillance tracking & UAVs, CCTV equipment, for effective delivery of police services to the citizens. BPR&D was established in 1970 in furtherance of the objective of the Union Government for the modernisation of police forces. It is a nodal national police organisation to study, research and develop on subjects and issues related to policing. It functions under the aegis of the Union Home Ministry. Since its formation, it has evolved as a multifaceted consultancy organisation. Q1. Who inaugurated the 2nd Young Superintendent of Police Conference that was held in New Delhi on July 26, 2018? Q2. Where is the Bureau of Police Research and Development (BPR&D) headquatered?